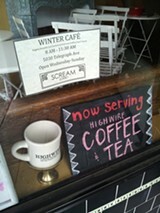 Scream Sorbet has new winter offerings. Winter is the cruelest season — especially if you're an ice cream shop or other purveyor of frozen treats. Even here in (relatively) balmy Northern California, the late-burning morning fog, sporadic rain, and chilly evenings don't tend to put a person in the mood for a cooling scoop of chocolate or vanilla. 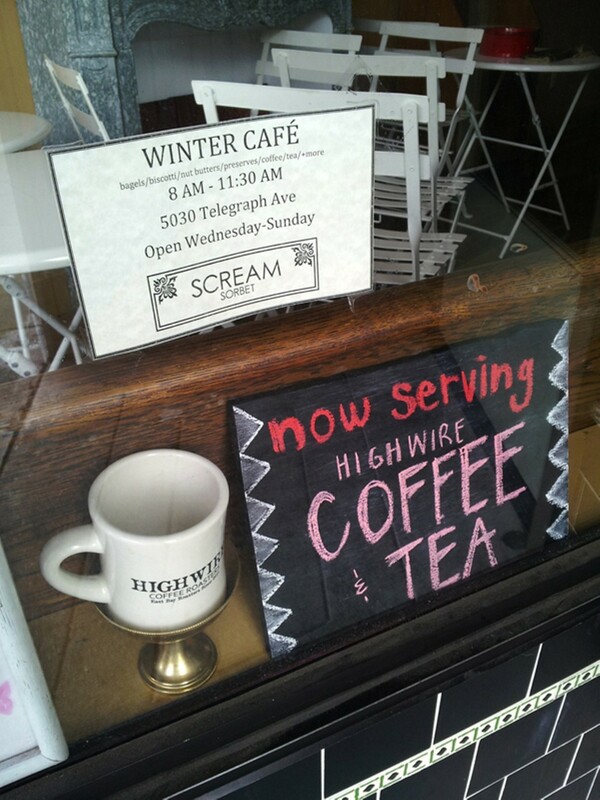 The folks at Oakland's Scream Sorbet (5030 Telegraph Ave.) have hit upon an innovative solution: For nearly a month, the sorbet shop has been opening early five days a week — Wednesday to Sunday, from 8 to 11:30 a.m. — as its newly launched "Winter Café." In the mornings, instead of sorbet, Scream sells coffee and tea, a variety of house-made baked goods and nut butters, and a Manhattan-style bagel — boiled and baked in-house. In short, the shop has diversified. According to store manager Mena Kamel, Scream's sorbet sales plummet during the winter months, and, in turn, production gets drastically cut back as well — by about 50 percent, he estimated. The cafe concept came about as a way for Scream to still offer its kitchen employees their full slate of hours during the winter months. The idea, Kamel explained, is to use all the ingredients they already have sitting around in their kitchen for something other than sorbet, so what you'll find at the Winter Café will vary from day to day. Recent (and delicious-sounding) offerings include apple fritters and roasted-pear-and-chocolate scones. Each of Scream's five kitchen employees is in charge of one day a week, and whoever's working on a given morning bakes whatever he or she wants. That said, there will almost always be biscotti, some kind of cookie, and the bagels: "Manhattan-style, very small, and very chewy," according to Kamel. As noted, these are boiled first before baking, and are available in two permutations (salted or unsalted) at $2 each — $3 topped with a nut butter or fruit preserve. About those nut butters: Kamel said they're made using a similar process as that used for the shop's highly acclaimed nut-based sorbets, and you'll find varieties you won't see sold at too many other places — macadamia-nut butter, cashew butter, and walnut butter. Ultimately, the jury's still out on whether the cafe will become a long-term fixture at Scream. The early word seems promising, though, and, according to Kamel, business has been better than expected so far. He noted that if the shop can just break even on the venture, it will have been a successful winter. Connoisseurs might differ in their opinion on which of the Bay Area's new crop of artisan bagel shops is best, but this much is indisputable: Up until a few weeks ago, it was nearly impossible to get a hold of a respectable bialy — that lesser known, mostly unheralded cousin of the bagel — in the East Bay. Fortunately, Beauty's Bagel Shop (3838 Telegraph Ave.) has rectified that situation: For the past several weekends, the shop has been selling a small batch of bialys, and I'm happy to report that they're as tasty and authentic a version as I've had out here on the West Coast. Just what is a bialy, you ask? Like bagels, bialys are a round, chewy bread product of Polish-Jewish origin. But otherwise they're a completely different animal: Unlike bagels, bialys aren't boiled first before baking, and so they're flatter and less dense — more delicate, when prepared properly. There is no hole in the middle of a bialy, just a slight indentation where — and this is key — there's a generous pile of diced-and-sautéed onions and poppy seeds. At risk of sounding like a heretic, I have to admit that when I was growing up in New Jersey (that underrated bagel mecca) it was the bialys that most captured my imagination — still warm, slathered with an unconscionable amount of butter, and as oniony as you'd ever want any breakfast item to be. The problem is that most bagel shops around these parts don't make bialys at all — or if they do, they're just second-rate bagels cloaked in a bialy's "onion-strewn clothing," as one recent Food Republic article put it. Beauty's co-owner Amy Remsen got her bialy recipe from her friends at Wise Sons Jewish Delicatessen in San Francisco, who in turn got it from a baker in Los Angeles. According to Remsen, the recipe is as simple as can be — just flour, yeast, salt and water. But the trick is in the execution. Remsen said she only tweaked the recipe to make her bialys a little smaller and puffier — less crispy than the Wise Sons version. For now, Beauty's is offering a small batch of about forty bialys on Saturdays and Sundays only. They're priced at $1.50 — same as the Beauty's bagels — and you can substitute them for the bagels in any of the various bagel sandwiches that the shop has on the menu. Or, for $2.25, you can have them as Remsen likes to eat them: topped with butter and a little bit of sea salt.